When considering President Donald Trump’s attempts to keep foreign migrants out of the US, remember who put him in power. It was by all accounts working class people in areas decimated by neo-liberal policies. Remember also that Trump is trying to secure the support of US trade unions for his reconfiguration of these policies. One commentator has described this as ‘eat[ing] the American left’s lunch’ (Harris, 2017). It should come as no surprise to South Africans that trade unions can support a racist, right wing government. That was how it was in 1976. The South African government of the time was also trying to keep out migrants who were not white, and the established union movement was more or less complicit. Those unions that did not actively support the bars to non-racial organisation imposed by apartheid did nothing to undermine them. In practice, their commitment to solidarity extended only to organised workers. That year, I became general-secretary of a trade union (‘the union’). The union came from a tradition in which solidarity meant making common cause with unorganised workers everywhere. However, little evidence of this tradition remained by 1976. It had been corrupted organisationally, and there were leaders ‘eating the money’. In my book Solidarity Road: The Story of a Trade Union in the Ending of Apartheid, I explain how the revival of the union came about through organising women and migrant workers, and rebuilding democratic worker-run structures. Of course, no single union could hope to accomplish these tasks alone. 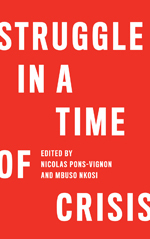 The union’s story is also about how it allied itself with other unions to form the Congress of South African Trade Unions (COSATU) in 1985, and in so doing consolidated union opposition to the established union movement and the apartheid state. However there was always the danger that once the racial bars imposed by apartheid were removed, COSATU and its affiliates would become much like the established union movement they eventually displaced: controlled from the top, and more committed to solidarity amongst organised workers than organising the unorganised. This, I argue, is exactly what has happened some thirty years later. To understand how and why, we must question certain popular narratives about COSATU. Given the emphasis in these narratives on its tradition of worker control, this is a good place to start. The term ‘worker control’ always meant different things to different people. In the talks leading to COSATU’s formation, it came to mean the control ordinary members were supposed to exercise over their own organisations. But this worker control was undermined from the start by the fact that in almost all the unions, workers never got control over the money they contributed, as I will later explain. On top of this, people who were not workers (or no longer workers) began to occupy leadership positions which were supposed to be reserved for workers. This practice reached an entirely new level with the institution of the full-time shop steward. Until then, a shop steward was a worker working alongside his or her fellow workers, and paid on the same basis. Critically, workers could recall the shop steward at any time without reference to their employer. It is not clear who first had the ‘clever’ idea of getting the bosses to employ shop stewards on a full-time basis, because it was never openly debated. For this reason, in my book I refer to it as a ‘surreptitious scheme’. However, it should have been obvious that such shop stewards, operating from an office their employers provided, could never be subject to the control of the workers who elect them. The workers at Lonmin’s Marikana mine were not the first to discover that their shop stewards were, in truth, an extension of management. But previously, the labour relations system and courts had managed to contain worker outrage at such malpractices. This was no longer possible after the 2012 Marikana massacre. Thousands of workers voted with their feet by quitting the National Union of Mineworkers (NUM). It had been COSATU’s largest affiliate. Why did some trade unions go along with this scheme in the first place? In the late 1970s and early 1980s, the question confronting the new unions was whether registering with the state (on the terms it was offering, as it began to deracialise labour law) would compromise their autonomy. Yet their conception of the state was a very narrow one. Even unions that were implacably opposed to registering had no scruples about using the courts, for example, which are, of course, an arm of state. At the same time, important unions displayed a curious disregard for the threat posed to their autonomy by employers. Some even saw multi-national corporations (MNCs) as potential allies in their struggles with the state. MNCs had their own reasons for fostering this belief. They also had a clear idea of the terms on which they would recognise unions, whereas unions were prepared to enter into agreements with scant consideration for their longer-term implications. The first agreements introducing full-time shop stewards were with MNCs, in the early 1980s. It also suited MNCs to foster a misconceived emphasis on workplace organisation through the agreements they negotiated. Workplace organisation is obviously important, but what is more important is that workers from different workplaces have places where the can meet. That is how workers develop their identity as a class. In my union, the primary place to meet was the branch. Importantly, the branches were financially autonomous. This decentralised model meant each branch could employ its own paid official, and pay his or her salary. This also gave workers real control of their money, and hence their officials. But all the other unions that formed COSATU adopted a centralised organisational model. Their head offices controlled the money, and all the paid officials were in effect accountable to them. Bureaucratically minded leaders wanted it that way, as did foreign donors. When COSATU was formed, it adopted a policy of having one union for one industry. This meant merging different unions in the same industry. My union was confronted with a choice: merge with other unions in accordance with the policy and abandon our decentralised model, or defy the policy. The union opted to in fall in line with the others. The consequences were disastrous. There was a dramatic decline in the capacity of branches to respond to the needs of organised workers, because local officials were starved of resources. Initiatives to organise unorganised workers ground to a halt. Such initiatives are best undertaken at branch level because employment practices change, and branch officials are more likely to know when this happens than a bureaucrat at head office. The rise of labour broking, for example, represented a profound change in employment practices. It also illustrates how slow COSATU and its affiliates were to respond. Labour broking was facilitated by a loophole the new Labour Relations Act adopted in 1995. COSATU said nothing about this at the time. When there was an opportunity to amend the law, some five years later, it still said nothing. For more than a decade, it failed to address the glaring inequities labour broking generated. Even now, it has made no effort to organise workers employed by labour brokers. The rise of labour broking was only one of several changes in employment practices in the late 1990s and afterwards. There were various ways in which COSATU or its affiliates might have responded to these. However, they all required organising the workers affected at a branch level. COSATU and its affiliates failed to put any resources into that, despite being awash with money. This was a result of making subscriptions a percentage of what workers earned, rather than a flat rate (another measure calculated to consolidate head office control over workers). Rather than spend money on organising the unorganised, or on strike funds, COSATU money was siphoned off into investment companies. As with the institution of full-time shop stewards, this was done without debate. Union investment companies enabled leaders to take the pursuit of their own interests to a whole new level, creating of class of ‘unionaires’. The symbolic statement this made was that the trade union leadership could aspire to become wealthy overnight. The demise of NUM following the Marikana massacre precipitated a sequence of events that lead to a decision by COSATU to expel the National Union of Metalworkers of SA (NUMSA). What was most extraordinary about this decision was that NUMSA was COSATU’s largest affiliate at the time. NUMSA has now spear-headed the formation of a new federation, the South African Federation of Trade Unions (SAFTU). SAFTU will have to decide whether it is going to represent a real alternative to the perverted form of unionism COSATU has come to represent. That necessitates organising unorganised workers, and in particular migrants and women. It also necessitates serious measures to ensure real worker control. This is more than ever necessary in the time of Trump. Effective worker organisation is the best defence against a descent into populism, presaged by COSATU’s disastrous decision to back South Africa’s own populist president. In 1976, Jan Theron became general secretary of the Food and Canning Workers Union (FCWU), and when it merged with other unions to become the Food and Allied Workers Union (FAWU), in 1986, was its first general secretary. Since leaving the union movement he has combined legal practice and research with the Labour and Enterprise Policy Research Group (LEP) at the University of Cape Town. He is the author of Solidarity Road: the Story of a Trade Union in the Ending of Apartheid (Johannesburg: Jacana, 2016). How to read the 2 September strike in India?